The diverse natural resources, varied terrain and highlands of Kenya comprise one of the most successful farming regions in Africa. However, arid climate means the country’s main economic driver of agriculture is highly dependent on seasonal rainfall. In 2014, the World Bank reclassified Kenya as a lower middle-income country, but poverty, food insecurity, undernutrition and income inequality remain high; 45.6 percent of Kenyans live below the national poverty line. The most severe conditions exist in the arid north, which is underdeveloped, drought-prone and often disrupted by local conflicts. There are high rates of undernourishment with acute malnutrition among children aged 6 months to 59 months often exceeding 15 percent. Stunting stands at more than 25 percent in some counties. Enrollment in primary education in arid counties is still below 50 percent. The 2010 Constitution devolved governance in an attempt to address these developmental issues. In addition, Kenya hosts one of the largest refugee populations in the world, with more than 500,000 currently living in the country. WFP has been present in Kenya since 1980. Harmonizing relief and nutritional support with emerging government safety net programs. Strengthening assets to improve food security and enhance resilience to climate-related shocks. Enhancing partnerships to scale and ensure the sustainability of assets. Support for national social protection and safety net systems. 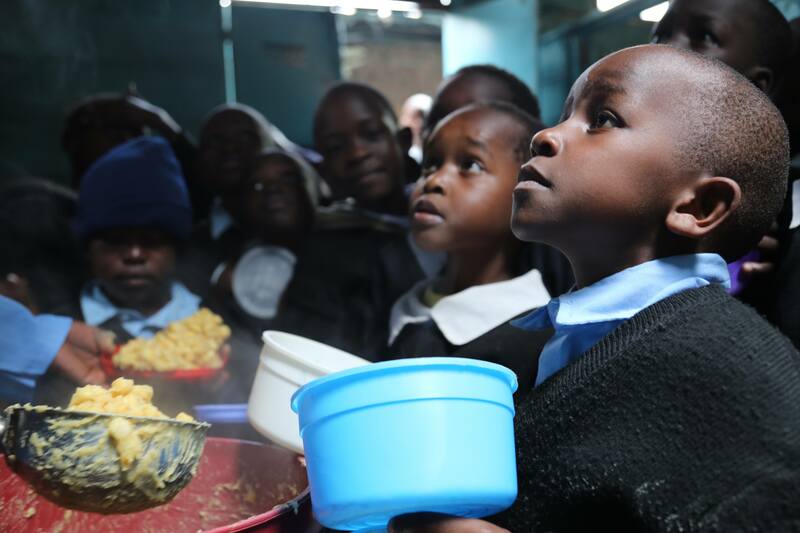 WFP supports the Kenya school meals program, enhances market access for smallholder farmers and supports the National Nutrition Action Plan. In addition, WFP provides food assistance to refugees—most of whom are from Somalia and South Sudan—in the Dadaab and Kakuma camps, mainly through a combination of in-kind food and e-cards. Refugees pass through an innovative biometric fingerprinting system to ensure their eligibility before collecting their assistance, allowing for better efficiency and accountability. Refugee mothers and children are also treated for moderate acute malnutrition with complementary specialized food, while refugee schoolchildren receive porridge as a school meal. WFP also provides support to the host community through asset creation and food-for-training activities. Ahead of the intended closure of Dadaab camp, WFP is issuing Somali refugees with reusable e-cards before they return to Somalia. These cards are loaded with funds equivalent to a six-month food assistance package, which they can redeem from contracted traders in Somalia.